This is a new product from XtremeThings for your Ford Probe GT, Mazda 626, MX6 or any other 2.5L V6 KL manual transmission car. This is a set of bronze shifter bushings to replace the plastic OEM shifter bushings. Often these OEM pieces are not even present due to pre-mature failure. When the plastic bushings fail -the shifter has far too much slop and may even tend to slip out of gear. 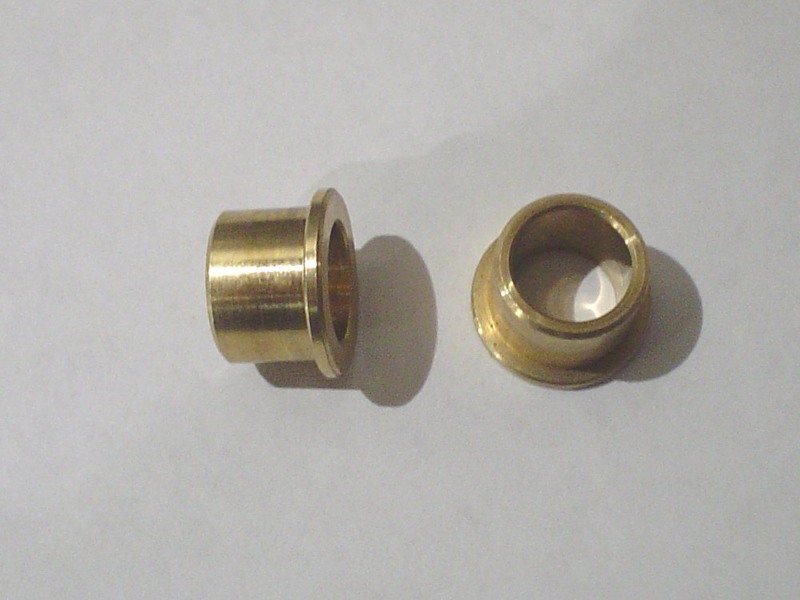 These bronze bushing replacements are far more durable and will restore your shifting function to OEM or better. These are a semi-press-fit and should only need some tapping to install. Take care when tapping them in -to not deform the bore. I use the original pivot pin that goes through when connected to the shift shaft. Just tap on the square head with a hammer. 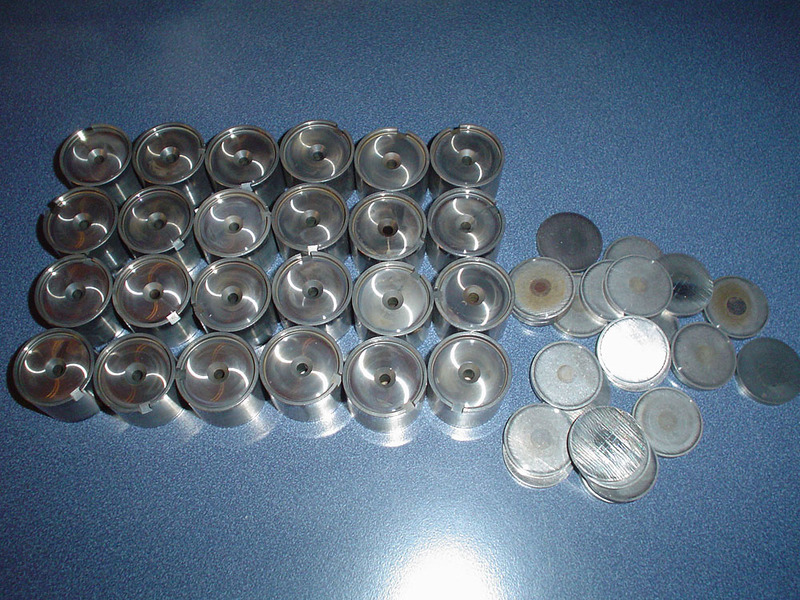 If the pin sticks when inserted -there may be a slight build up of corrosion or oxidization. If it is not quite a free fit -just use some 400 to 800 grit wet-or-dry sandpaper to smooth up the pin surface. 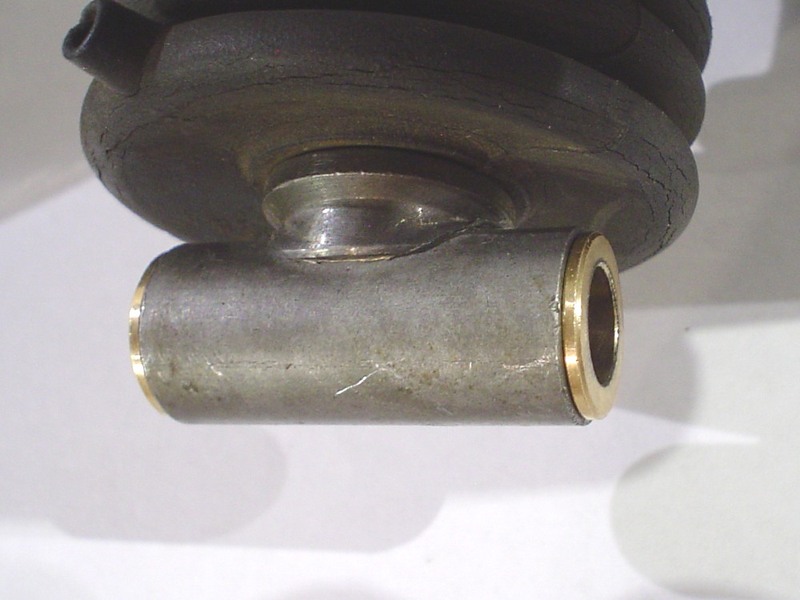 Be sure to put some grease into the bore with the bushings before installing the pin. If you would like to purchase a set -the price is $20 plus shipping. This price is for two bushings. E-mail to request a PayPal invoice. Click the image for a super-sized photo. This is a meticulously made stainless steel head or manifold porting template for the KLZE port shape. They were accurately designed in CAD and then imported into a laser cutter for an exact port and bolt hole alignment. I have put one on a head for test fit and it fit perfect with no filing of holes necessary. I made the holes so that it fits snug for exact alignment. Slop in the holes would have lead to a sloppy alignment. You can use one of these to port KLDE heads to flow identically to KLZE heads (assuming you have some decent porting skills) or you can use the template to open up the KLG4 ports to match to KLZE heads. You can also use it to do exact port matching from KLZE to KLZE. NOTE: If opening up the oval port intakes to KLZE shape -care must be taken in the rearward corners of the rear bank of runners to keep the flange width from becoming too narrow to make a good seal. Also -it is recommended to cut your own gaskets from gasket sheet material and glue them to the intake flange to make a better seal. The metal layer type gaskets will not make a good seal between modified oval port intakes and square port heads. If you would like to purchase a template -the price is $28 plus shipping. This price is for one template. One template works for both sides as the head port arrangement is symmetrical. E-mail to request a PayPal invoice. 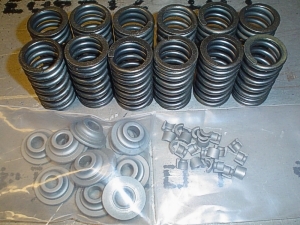 This is a KLZE-KLDE valespring/retainer modification kit.. Included is 12 KLDE valve springs, 12 KLDE retainers and 12 sets of locks. I pull these from KLDE motors, clean them thoroughly and inspect them for structural integrity. If you plan on running your KLZE to higher RPMs then you will need to upgrade the springs and retainers because the factory KLZE intake retainers have a structural design flaw that causes them to break at high RPM so that you drop valves. 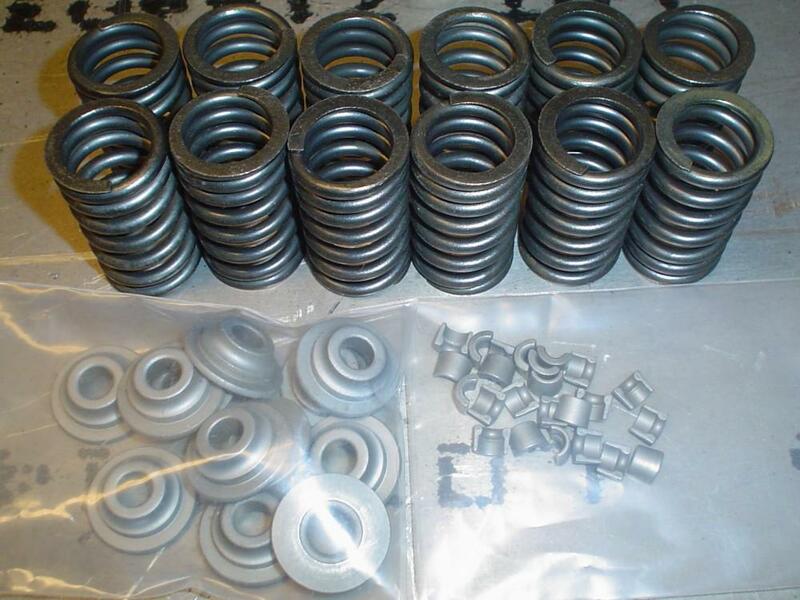 Now you can get a set of these KLDE valve springs / retainers for your engine and have a little more confidence that it will stay together at higher RPMs. If you would like to purchase a set of these the price is $50 plus shipping. This is a set of lightweight, hollow-stem solid lash adjusters (SLAs). Typically the stems on these are solid but the hollow stems on this set reduces the weight even further than typical hydraulic lash adjusters. And SLAs to not have pump-up lift inconsistencies that HLA's often have when the oil ports become clogged. The cost for this set is $120 USD plus shipping. I change the RPM limit from 6,800 (which is stock for most US KL cars) to 8,000 RPM. This unleashes a much wider power band that you could not experience before with the stock ECU. 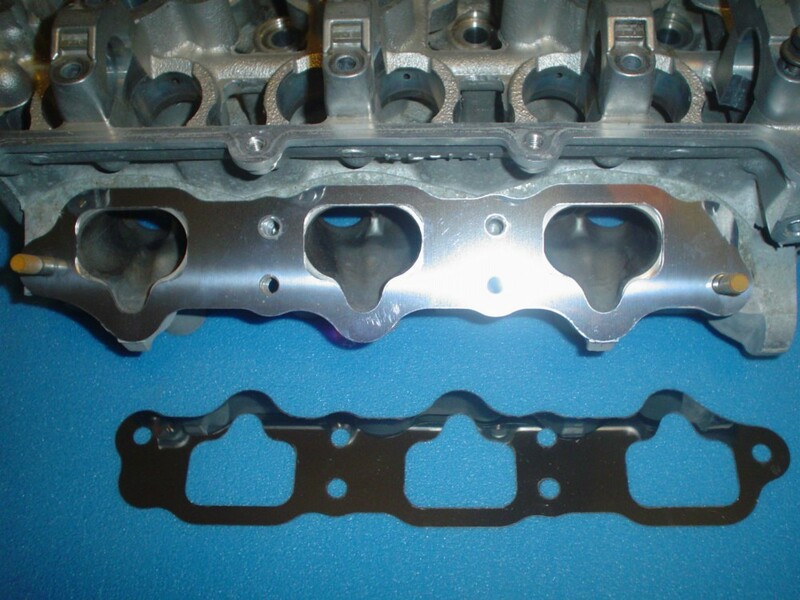 With the correct valve springs you can make a lot of power above 7,000 RPM. You can swap out the ZE valve springs and retainers for DE ones and these will do fine! Also the air/fuel mixture is raised from 10.5:1 to 12.5:1 for a typical engine in good running shape with good O2 sensors. The VRIS points are set for the long neck KLZE intake manifold but upon request I can leave them at KLDE points or modify them for the KLG4 intake. Keep in mind that when you purchase an item from Xtremethings - nearly all of the profits go right back into research and development of new products. So to help in the efforts -when you purchase an item and become satisfied with it -then please pass on the word. Your help in spreading the word will be helping with the continued research and development of new products that were currently un-available. 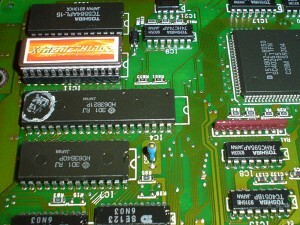 One of the most popular items I have is the Xtremethings chipped ECU for 93-95 2.5L V6 Probe GT and Mazda cars. These ECU's improve the performance significantly above 4,000 RPMs. 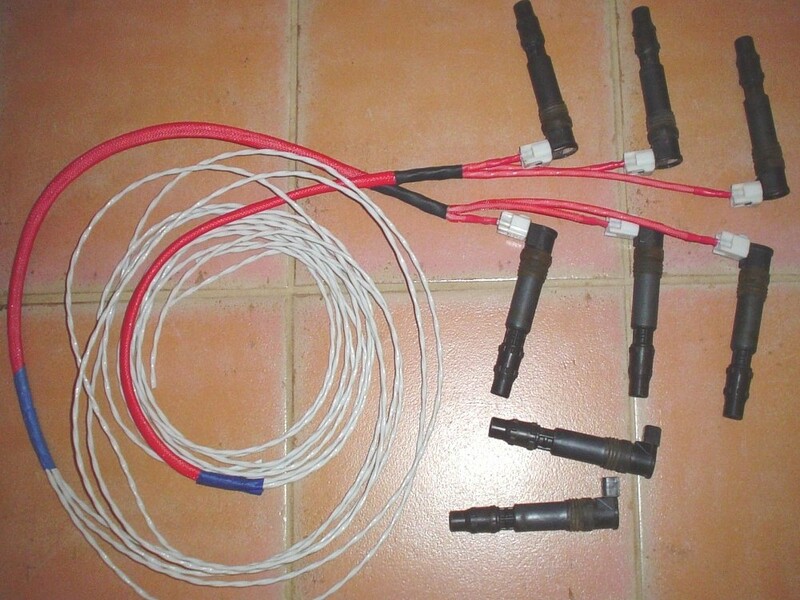 It will also eliminate an Engine Check Light (ECL) cuased by faulty O2 errors or EGR codes. Also this computer will work with your OEM (KL02) air sensor unlike a JDM KLZE computer that requires a JE50 MAF sensor. If you are currently running a stock computer you will be impressed with the gains. 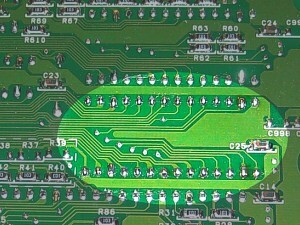 The highlighted area above shows how my solder joints are better than OEM ones nearby. I do this soldering work myself and I have 23 years of electronics experience so you can be assured that it is done correctly. All 93 and 94 ECUs are thoroughly tested after modification. The ECUs are $220 plus shipping. Please inquire about shipping costs before sending money. 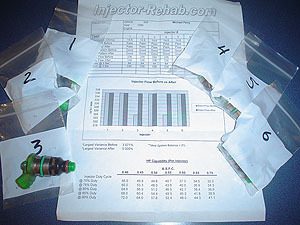 I currently have a wide selection of injectors in matched sets that have been professionally cleaned and flow tested. 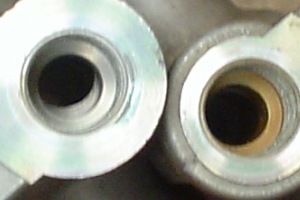 In the photo to the right is a matched set of 336cc injectors. 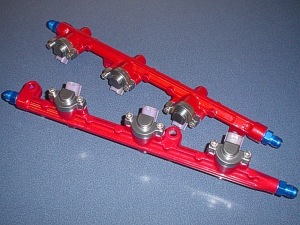 These injectors are a direct drop-in for KL rails without no modifications to the rails. They are matched to less than one percent difference. 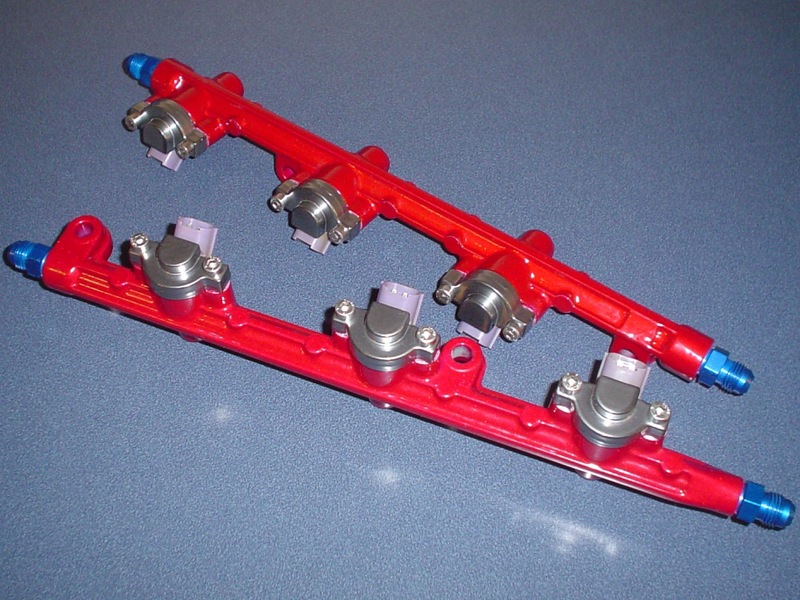 This is an exceptional set of injectors for a medium boosted application. If you would like to purchase this set - the price is $360 plus shipping. Wiring pigtails and hold-down caps are included. Email to request a PayPal Invoice! 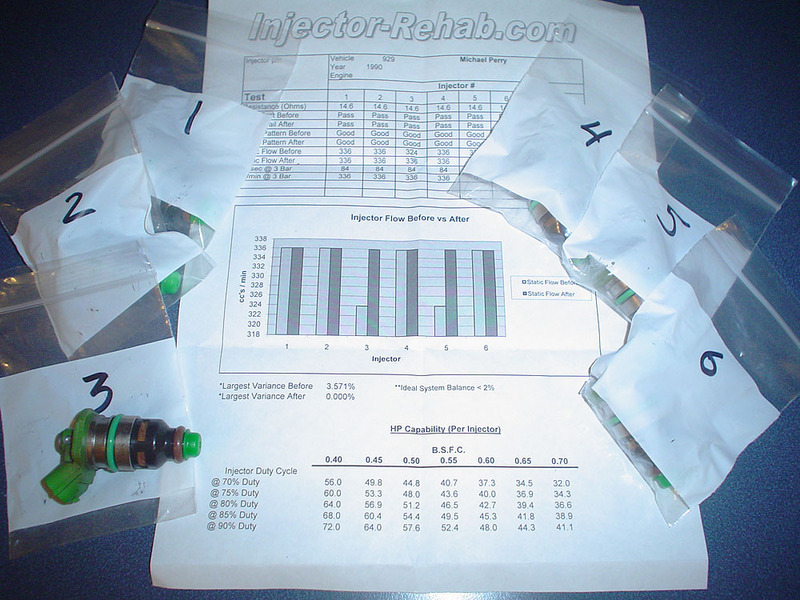 I also have cleaned and flow tested matched sets of 550cc and 850cc injectors. As seen in the photo to the left -I can also powdercoat and modify rails with A/N fittings to make them not only functional but very nice looking pieces. For a set similar to the set seen to the left with matched 550cc injectors, custom modified and powdercoated fuel rails with -AN fittings, rail bore run-out correction and powdercoated hold-down caps I am asking $850 plus shipping. This is the ultimate in fuel for your turbo'd monster. Email to request a PayPal invoice. To the right here you can see what fuel rail bore run-out is. 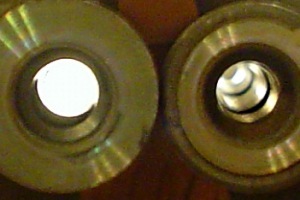 The rail in the left of each photo is a severe case compared to a less severe case on the right. No two run-outs are the same so a rear rail can be severe while a front one less so or visa-versa. 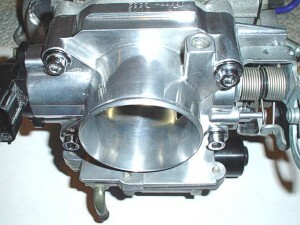 This factory flaw can cause a severe in-balance between the front and rear cylinder banks during high fuel flow demand. You do not want this if you want maximized power. Also this can be bad on your engine because of incorrectly balanced fuel/air ratios between banks. The KL factory fuel rails are bored after casting with a long drill bit. The drill bit wanders from center as it nears the other end. 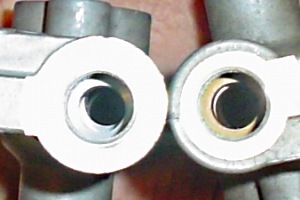 To make it look centered on the other end - they stop before the end and then drill from that end to meet the two bores. This leaves a sometimes severe overlapping section and restriction between the two misaligned bores. I correct this problem with all of my fuel rails so that both rails will flow equally under high fuel flow demand conditions. 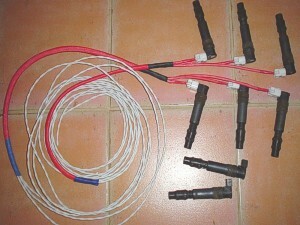 I also can set you up with a set of 850cc matched fuel rails. Just let me know what you want and I will make it so. I can either accept direct PayPal payments or I can set up an ebay auction for you if you prefer. 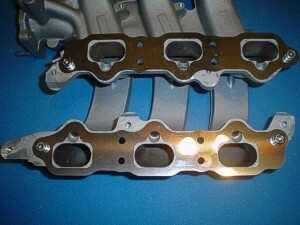 I do custom work such as seen in these throttle bodies. I can cone the bore, hourglass the butterfly shaft and even polish it if requested. 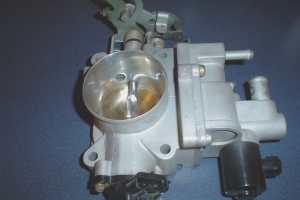 A coned bore, hourglassed shaft throttle body is $165 plus shipping. E-mail to request a PayPal Invoice. I also can build custom Xtreme quality wire harnesses such as the COP harness in the photo above. Click it for a larger image. I have many years of experience in wire harness building and so no job is too big for me. I have built wire harnesses and installed equipment on everything from Cessna 150's to Gulfstream G5's.